Our integration maps your Kabuto customers and alerts into the system as Customers and Tickets, allowing you to get more done in fewer steps. This is a special feature of our integration that allows you to send a customer a special URL that will give them a "Kabuto Customer Installer" even if they don't exist in Kabuto. On a Ticket you can click the button to "Send Kabuto Customer Installer URL" or use the tag in a Marketr campaign. If the Customer already exists in Kabuto, they'll be matched up properly and get the right "Customer Installer URL" from Kabuto as expected. If the Customer exists in the system but not Kabuto, when they click the link that Customer will be instantly (and magically) imported into Kabuto and mapped - so when they install they'll be under the correct Customer with all their info attached and also mapped to the right Customer in the system. Either way - once they have installed the software their "Device" in Kabuto will also exist as an "Asset" and be mapped. 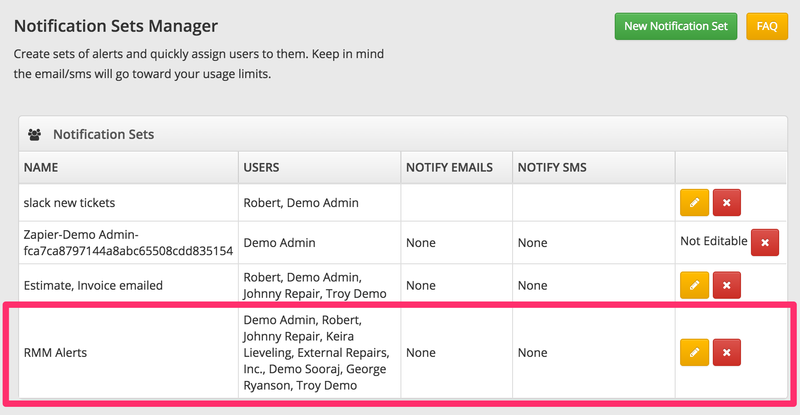 Go to your Kabuto account and find us in the Settings -> Integrations page. Put your RS subdomain in, and enter your RepairShopr API Key. You can find your RepairShopr API Key by going to the profile drop-down in the top right corner of the RepairShopr Dashboard, and clicking the "Profile/Password" link from within that drop-down. Once the page loads, you'll see your API Key there in pink highlighted text. Copy/paste that into the API Key field in the Kabuto Online Dashboard. Lastly, configure the Options for the integration, and click "Test RepairShopr Credentials". Head over the the RepairShopr App Center, and click the Kabuto App card. Click the "Configure Now" button. Enter your Kabuto API Key. You can find this on the Kabuto Online Dashboard by going to the Setting page. Map your "Devices" to RepairShopr "Customers" by clicking this blue icon for each that we didn't automatically detect. This will make it so the assets and alerts are attached to the right customer. Now you'll be on an informational screen showing some counts, this means you are all set! Now you will start getting alerts using the Notification Center in RepairShopr. You can adjust how and when you are alerted, head to Admin -> Notification Center to find the new rule that we created. Next to alerts you'll be able to map them to a customer if they are connected to a "Group" that isn't mapped, you can view the details of the alert, and also convert the alert to a "Ticket"